Damage/Repair General wear. Scuffs and scratches throughout. Additional Information: This wonderful and old maternity figures comes from the Baule people. The figure embodies a number of symbolic elements found in shrine figures; she is a mother and for the diviner she is a place of residence for the spirit of the bush to reside, ready to be called upon by the diviner. Advised by the bush spirit (asye usu) the diviner will determine the reason that a woman is barren and direct her as to what she must do to bear children. It is the energy and power of the bush spirits that are contacted by the diviner and directed to help the woman. 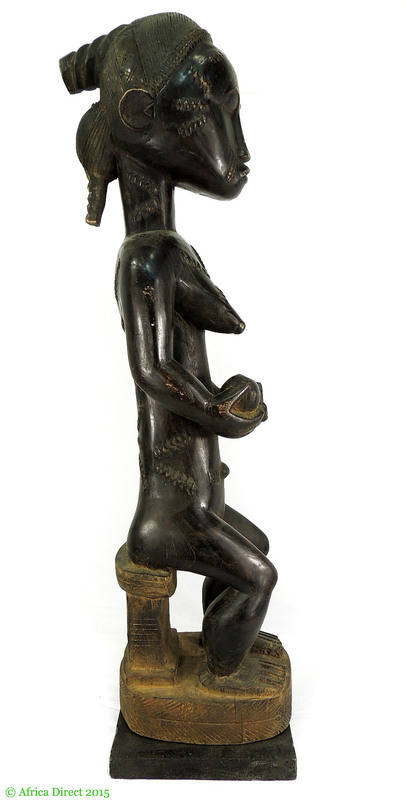 This well-carved figure exhibits typical Baule concern with the aesthetics of motherhood. She is seated on a stool, to be expected of a person of importance. This is old figure and it is shown by the quality of the wood and the aesthetic value of the piece, as well as the worn on the surface. 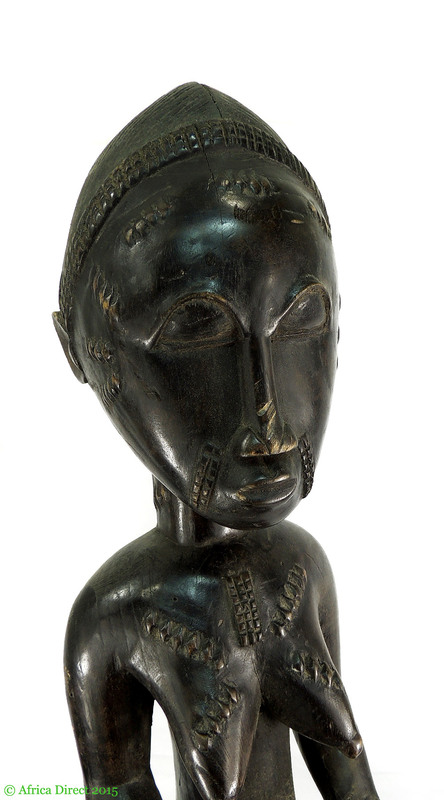 The figure would be a great piece of Baule sculpture to add to a collection. This seated figure of a woman nursing a child with traces of much handling surface indicates long use and substantial age for this superb figure. Classically-carved figures such as this mother and child among the Baule were very often owned by diviners known as Komien, who could tell the future, cure illnesses as well as solving local community problems.